The degenerative disc disease occurs from the weakening of one or more vertebral discs in the spine. These discs normally serve as a cushion between the vertebrae. This type of condition does not develop from an unhealthy lifestyle, but instead as a natural part of the aging process. However, it can result from a blunt injury to the back, as can other medical problems. The purpose of a spinal disc is to be a shock absorber in between the bones of the spine. While also allowing us to stay flexible and agile. The spinal disc has two parts, an outer portion which holds all the nerves, and a softer center containing tissues and proteins. With all the nerves existing in the hard and outer part of the spine, this is why an injury to our back can be so painful. Typically, the degenerative disc disease begins with a small tear in the disc wall, also called the annulus. The disc wall tears can cause intense pain for the patient. 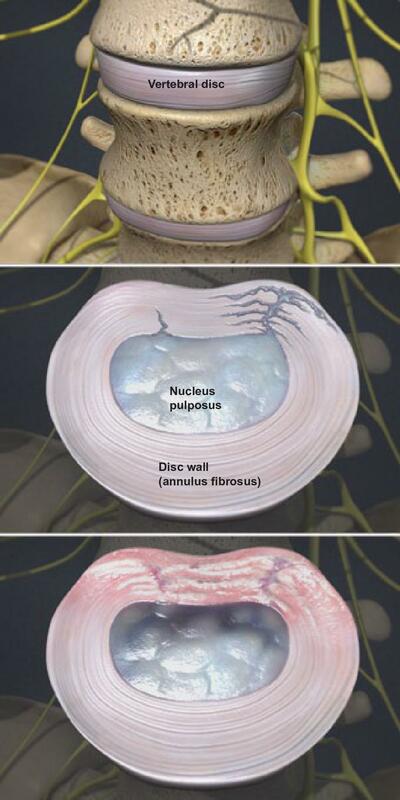 While the disc wall tears are healing, scar tissue is formed, although it lacks the strength of the original disc. When a back is continually injured, it keeps repeating the process of tearing and then scarring. In time this will reduce the strength of the disc wall. With all these changes to the disc wall, the disc center or nucleus will lose some water from the damage. The water content is necessary as it is a shock absorber of the spine and helps keep the disc functioning over time. The nucleus may eventually collapse as it is only a cushion for the spine. Then the vertebrae above and below the damaged disc will slide closer together. This unnatural alignment can cause the facet joints, where the vertebral bones touch, to twist into an abnormal position. The unnatural positioning of the vertebrae may result in the formation of bone spurs. If these bone spurs grow into the spinal canal, the spinal cord and nerves may become pinched. This is a condition referred to as spinal stenosis, and it causes severe pain. Dr. Dax Trujillo specializes in many treatment options to manage back pain for degenerative disc disease. If you think back pain treatment may help, please call our office at 928-532-1605 to set up a consultation.